This one's all about random images from life around here recently. I keep my camera at hand in case anything interesting comes up, and even then I sometimes miss things. Like the day we drove back up to the house from a shopping trip and saw a very big porcupine with its spines fully puffed up in the garden up the hill. This male goldfinch is half of a mated pair who frequently fly into the feeder together. He's handsome enough in the shade, but when he's out in the sun he's a brilliant lemon yellow. Our friend Martin is a nurseryman. He got in touch early last fall and suggested coming up here and gardening together for a day. We had a great time, and he surprised us by bringing a very showy hosta and six of these beautiful phlox plants as gifts. We planted them where they'd be fully visible from the living room, where the fact that they've come up very full and covered with blossoms this spring can be fully appreciated. This is me, total history geek and still mourning some of the works both scientific and literary that are known to have been lost not only in the library at Alexandria but in the destruction of ancient libraries throughout the Greco-Roman world. 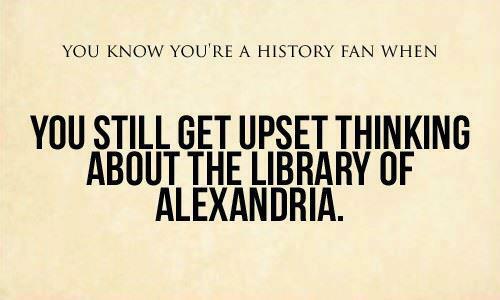 Alexandria lost several libraries by accident and by conquest over the centuries. The early ones, while the Empire was still strong and other libraries could assist in restocking Alexandria's, were not completely catastrophic. The last destruction, however, took with it incomparable and irreplaceable things. We took part of an afternoon off last week at Fritz's suggestion. I'd always wanted to visit a site called America's Stonehenge, located forty minutes or so south of here. It's controversial -- a fraud to some and a 4000 year old ritual space to others. It bears a relationship to the "real" Stonehenge mainly in that it's constructed of stone, some of it in the form of monoliths up around eight or nine tons in weight. Much of it is built into the ground in the form of open-faced rock chambers "roofed" by massive flat slabs. The table rock with the carved channel, above, bears the somewhat sensational name of "sacrifice stone." There is also a Stonehenge-like astronomical alignment, from a particular place adjacent to the sacrifice stone, to various other pointed rocks standing in a circle around the edge the site. A chart and list of the equinoxes, solstices and seasonal ritual sunrises and sunsets that are visible over those encircling stones on particular dates is provided. Now there's no absolute proof for any of this. 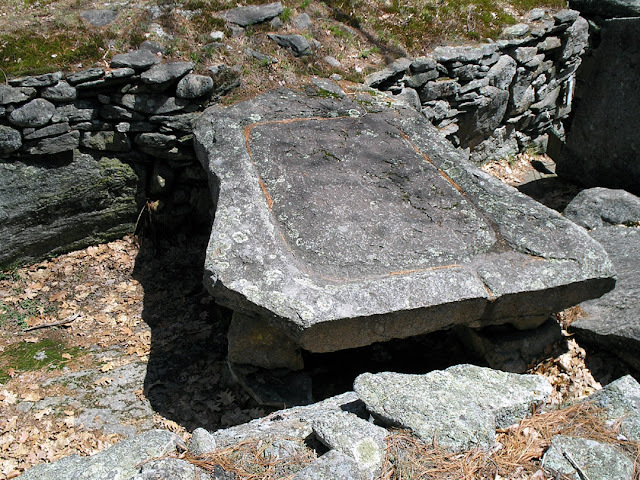 There is some carbon dating evidence for bits of wood or charcoal found amid the rocks being three to four thousand years old, but the rock itself is ageless, and proof of when it was set in place can't be firmly established. The early modern history of the site is confused by the fact that local farmers used it as a quarry site, hauling off or knocking down stones at will; then, when the property changed hands in the early 19th century, the new owner fancied himself an historical restorer and set stones up in what he felt were the correct places. It is during this phase of the story that the charges of fraud are most frequent: if he set up some of the stones, why not all of them? seems to be the reasoning. Apparently, there is no written documentation about the site in any condition prior to this confused period in its history. One thing I will say is that IF the site was faked it must have taken a large crew with whatever heavy lifting equipment was available in the area at the time. One would think word might have spread, or some mention have been found in surviving letters or local newspapers which, in those days, snooped liberally around town and published everybody's business in detail on a twice weekly basis. In any event, I had a great time, crawled around inside the so-called Oracle Chamber and we walked the entire site which is interesting whatever it is. Welcome to the wonderful world of 19th and early 20th century patent medicines. All sorts of horror stories exist about what was really in these concoctions, including completely unregulated amounts of alcohol and opium products that certainly made the patient feel better but didn't begin to cure the disease in question (laudanum, a potent mix of morphine and alcohol was given freely for everything from diarrhea to the pain of childbirth, addicting many wealthy and socially prominent women, including Mary Todd Lincoln, in the process). And yes, early Coca-Cola DID contain cocaine. Ads touted how drinking it produced a feeling of well-being and happiness. Yes, indeed! I had heard about the tape-worm method of weight loss along with some rather unpleasant stories about how the worm had to be made to expel itself from the intestines once the desired weight had been achieved. As an young opera lover, I was exposed to stories about how Maria Callas' dramatic weight loss in the early 1950s after she swallowed a tape worm had turned her into a glamorous high fashion-wearing diva. Many people debunk that story but several other major league sopranos of the day have sworn in print that the tape worm story is true. Of course, stories told by rival sopranos may very well not strictly be true! I love random posts like these ! I often wonder how the world would be different today had The Library not been destroyed. That, and where we would be today if the "Dark Ages" didn't happen. I need to try that tapeworm thing. I could stand to be a Diva! 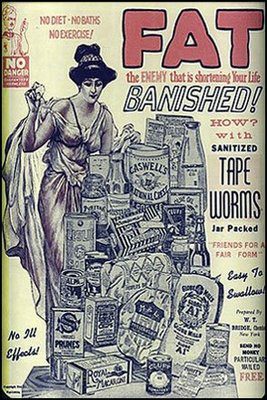 I had never seen an ad for the sanitized tapeworms. Astounding. Cool flowers and cute kitty.